The exhibition Michael Eden: Form & Transform is at Waddesdon Manor from May 25–Oct 21 2018. In November 2016, I visited Waddesdon Manor for the first time (Fig. 1). Coming up the long driveway, I noticed a series of decorative sculptures that were all wrapped to protect them from the winter weather, giving them an eerie, abstract quality in the grey light (Fig. 2). Upon entering the house, the effect continued: in the dim surroundings, the furniture and many of the objects were draped, making me think of a stage set where actors are about to enter (Fig. 3). At that moment, the seeds of my exhibition Form & Transform were sown. Fig. 1. Exterior view of Waddesdon Manor, Buckinghamshire. Image source: DeFacto – Wikimedia Commons. Subsequent visits to Waddesdon took place at other times of the year, when the house was emerging from winter or in its full glory with throngs of visitors, guides, and staff. On each visit I stayed in the “pink bedroom,” another dimly lit room where all the paintings, prints and photographs were draped in their bespoke covers. LEFT: Fig. 2. Covered statue in the gardens at Waddesdon Manor. Image by/courtesy Michael Eden. RIGHT: Fig. 3. Covered furniture and objects in the West Gallery, Waddesdon Manor. Image by/courtesy Michael Eden. On my tours of the house, either alone or under the enthusiastic and expert guidance of curator Mia Jackson, we further developed the format of the exhibition. The objects that interested me, particularly the Sèvres porcelain, are part of a room setting and are not displayed in isolation or in categories, as in a gallery or museum. So, the idea of creating an exhibition of “rooms,” each representing a different season and theme, was formed. As this idea was taking shape, I was having to narrow my focus on the specific objects that inspired me. Since making the Wedgwoodn’t Tureen in 2008 (Fig. 4) as my final project at the Royal College of Art (London), I have been inspired by the stories associated with objects. They may be related to the maker, the manufacturing method and materials, the time in which the object was made, or the journey that the object has travelled since it was created. Fig. 4. Michael Eden, Wedgwoodn’t Tureen, 2008. Image courtesy of Adrian Sassoon, London. 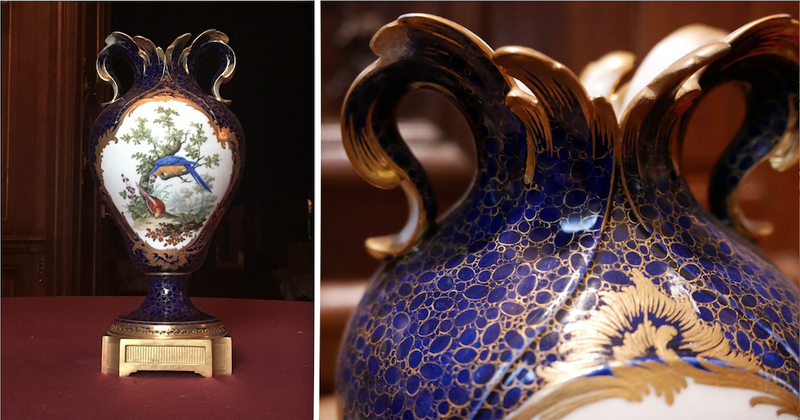 Sèvres porcelain is well represented in Waddesdon’s collection. There are some very fine examples, each of which has its own story and provides a starting point for my reinterpretation. For instance, the vermiculé and caillouté surface patterns were apparently derived from early microscopy images and demonstrated that the owner not only had refined artistic taste but was also aware of the latest scientific developments. Fig. 5. Process of 3D scanning a Sèvres Ship Vase (1762) at Waddesdon Manor. Image by/courtesy Michael Eden. In order to explore the exhibition’s themes, I arranged for a group of the Sèvres pieces to be 3D scanned by Scan the World, an organization that is building a huge collection of scanned artworks from numerous galleries and museums (Fig. 5). The scans they make are available for anyone to download and use free of charge. LEFT: Fig. 6. Gilded caillouté surface pattern on Armand l’aîné, Vase aux Oreilles, 1756 (Vincennes/Sèvres). Waddesdon Manor. Image by/courtesy Michael Eden. RIGHT: Fig. 7. Armand l’aîné, Vase aux Oreilles, 1756 (Vincennes/Sèvres). Waddesdon Manor. Image by/courtesy Michael Eden. Once I had the scans, I could start the process of re-designing the pieces with the aim of bringing their stories into the twenty-first century. For instance, the caillouté pattern, seen on the vase aux oreilles (Figs. 6 and 7), was translated from a 2-dimensional surface pattern to a 3-dimensional structure, each “pebble” section being arranged one at a time in the CAD software to create interior and exterior surface structures (Fig. 8). I then simplified the central cartouche illustration in Photoshop and again translated it from a 2-dimensional image to a 3-dimensional structure (Fig. 9). Fig. 8. 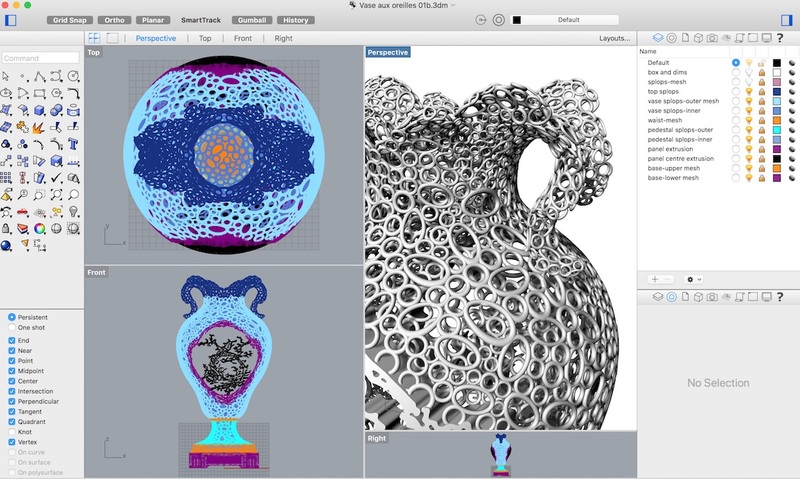 Caillouté Vase design by Michael Eden, using Rhino3D CAD programme. Image by/courtesy Michael Eden. I always begin the process of creating artworks in my sketchbook, where I make notes, sketch details, paste photographs and slowly give shape to the forms I wish to create. Once the idea is well developed, I then move over to the CAD software on my computer and begin the long process of drawing the virtual object. I either start with line drawings that can be translated into 3D shapes or I import the scan, as I did with the Waddesdon Sèvres pieces. Each design slowly evolves through a number of iterations, each one taking many hours of concentration. As the software was primarily made for engineers, I have to use it in ways it wasn’t intended. This can take a great deal of trial and error but can often lead to finding methods that I can then apply to other projects. When I am satisfied with the final form, I send it as a digital file to the company that prints the pieces for me. The relationship with the technician is fundamental, as he not only has to check that the data is free of errors but also understand that the relationship between my artwork and the original is important and that the quality of the print and its subsequent finishing treatment needs to be perfect. My previous experience as a potter makes me appreciate the craft and craftsmanship of the original artworks and my interpretations are intended both to honor the ingenuity and innovation of eighteenth-century artisans and to connect their work with makers today. Fig. 9. Michael Eden, Pair of Caillouté Vases, 2018. On display in the Form & Transform exhibition at Waddesdon Manor. Image by/courtesy Michael Eden. The exhibition was designed in collaboration with Mia Jackson from Waddesdon Manor, and Kathleen Slater and Andrew Wicks from Adrian Sassoon, London. Each of the artworks I created for Form & Transform explores one of the exhibition’s five themes, each of which is displayed within a mini “room.” In the first room, “Form and Fusion,” Spiralis employs the morphing of architectural details, while in Apollo-Inverto, I used the head of the Apollo Belvedere statue to create a positive-negative visual illusion. Both pieces are displayed alongside one of the huge draped roof finials found by the Waddesdon curators in the Manor’s stores. The artworks created for the other four rooms are accompanied by groups of fine furniture and objects from the house and stores. 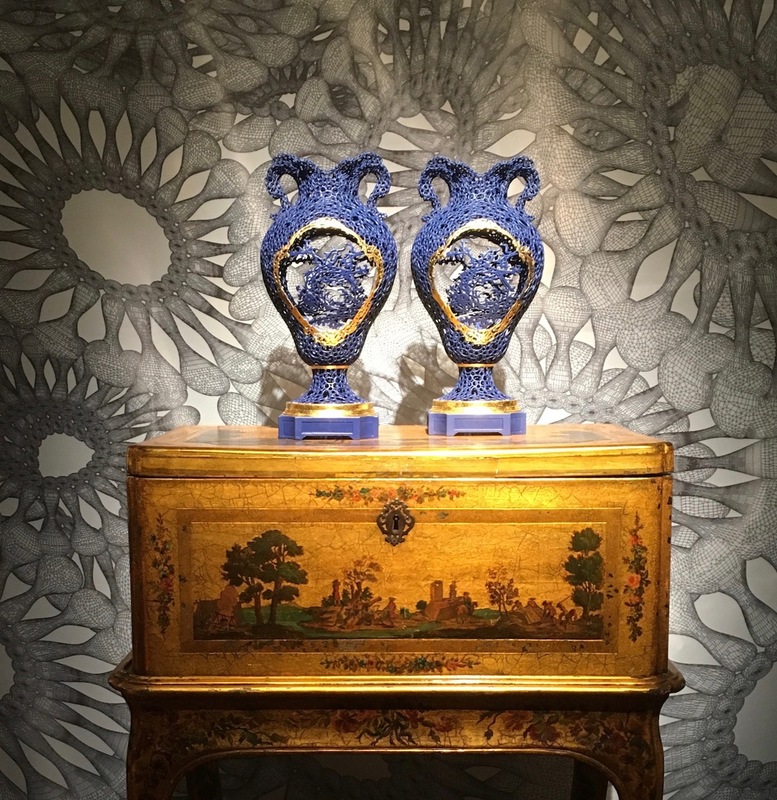 The overall effect when walking through the exhibition is a sense of moving from winter to summer, with the final Enlightenment room lit dramatically to illuminate my artworks, the Sèvres porcelain and the enormous gilded mirror (Fig. 10). Fig. 10. The Enlightenment. Room installation from the Form & Transform exhibition at Waddesdon Manor. Image by/courtesy Michael Eden. I hope that the visitor to Form & Transform will be able to gain insight into my artworks and the objects that inspired them. The history of ceramics (and humankind for that matter) has been one of continuous innovation and experimentation. Everything that the visitor to Waddesdon encounters is the result of our exploration of beauty and meaning through the development of materials, processes, fine craftsmanship and the desire to tell stories. 3D scanning is a method of capturing the form of an object as a 3-dimensional drawing. The resulting scan can then be imported into 3D CAD software and manipulated. Cite this note as: Michael Eden, “Artist’s Notes: “Form & Transform” at Waddesdon Manor,” Journal18 (August 2018) http://www.journal18.org/2823.